This entry was posted in History, Medieval Europe, Popular Delusions and tagged Ancient Rome, barbarian invasion, Byzantine Empire, Byzantium, Carolingians, Catholic Church, Christianity, Dark Ages, dark ages graph, Decline of the Roman Empire, Germanic peoples, Greek, History, Julius Caesar, medieval Europe, Medieval History, Merovingians, Middle Ages, middle ages graph, Ostrogoth, Ostrogoths, Roman, Roman Empire, Rome, scientific advancement graph, the Papacy, Vandals, Visigoths, Western Roman Empire. Bookmark the permalink. Thank you for the comment, and I do agree, but shhhh! That’s all coming in part 2! Spoilers!! Looking forward to it! I have to deal with graphs that either have no units of measurement or misinterpret numbers for “PR” purposes and it frustrates me to no end. Thanks for the comment!I have a series in mind, giving out about deceptive and annoying things like this… This essay was much longer, but has undergone a certain amount of butchery, which may make its way into Part 2, and I am already plotting Part 3… Medievalthought has raised a few interesting points, a few of which, as I responded, I hope to discuss. I find graphs, in any other field than the sciences, are often misused, or misinterpreted, and I would be very cautious of anyone who plots a graph concerning history, and especially so of per-Industrial Revolution history; there’s just not enough reliable data. I also appreciate that you used Canadians to fill the role of “Germanic peoples, pagans mostly, who tramped around the Western Empire, generally making a mess of things” in your United States – Rome analogy. And congrats for the post, it’s good to see that there’s still intelligent life among the atheists! I absolutely agree that the measuring of ‘scientific advance’ is borderline impossible before the modern era, but I do not believe that I treated science and technology as one thing; I did note that “just because things were thought of, or invented, doesn’t mean that they were used. A Greek also invented the steam-engine about 2,000 years ago, but nobody cared because slave-labour was cheap. Greek philosophers, while being very clever and all that, had no evidence of their theories… and so didn’t really offer a tangible and useful alternative to traditional thought. What I am trying to get at is that the importance of an invention or theory is dependent on its usefulness” in an attempt to divide theory from practical, i.e. technological, results. One could also add to your suggest of Dalton, the Ptolemaic model of the universe, which blatantly did not agree with observational data but remained in use for centuries due to the (unwarranted?) esteem in which ancient scholars were held, and the teachings of various religions. The graph is, as you say, nonsense, in every meaning of the word. I understand you don’t like arrogant Christian factions bragging about how they invented the foundation for modern science. because most of those claims aren’t really factual they tend to be really distorted to service some theological agenda. But you can’t blame Catholicism and organized-religion for man-kinds scientific stagnation during the middle-ages. Catholicism did not cause the economic and political conditions that existed already after the fall of Rome. build on the scientific achievements of previous generations, which had nothing to do with Catholicism. Those problems existed way before Clovis, Æthelberht, Mojmír I, Vladimir the Great, Khan Asparukh, Mieszko I, Stephen I of Hungary, and Charlemagne even made the choice to convert their nations to adopt Catholicism in the first place. that have happened before in human civilization completely isolated from Catholicism. During the Greek Dark Ages the Bronze Age civilization Mycenaean collapsed after they were invaded by the Dorian. When the Mycenaean civilization fell it caused the collapse of the palaces centres, no more monumental stone buildings were built and the practice of wall painting ceased; writing in the Linear B script ceased, vital trade links were lost, and towns and villages were abandoned. The population of Greece was reduced, and the world of organized state armies, kings, officials, and redistributive systems disappeared. Your forgetting during the middle-ages Christianity serviced to provide a limited but temporary solution to the deterioration that occurred in Western Europe. Church scholars were the only ones preserving knowledge of classical learning. Aside from that Western civilization was politically fragmented and all literacy had declined completely. Without Christianity in the early medieval period, the primitive animist barbarian warlords who took over Western Europe probably would still be killing one another in savage tribal warfare. Until a more advanced civilization like the Islamic Caliphates conquered all of Western Europe in a religious Jihad. Obliviously by the later periods of the middle ages Christianity out grew its usefulness to Western Europe. But Christianity was still instrumental in uniting Western Europe so that the great monarchies of France, England, Spain, and the Holy Roman Empire, and the development of more progressive scientific thinking could occur. I don’t think its fair to blame all the turmoil of middle ages on the Christians. 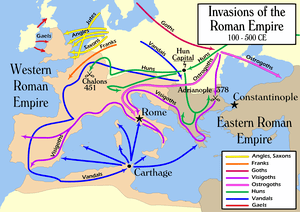 A lot of pagan rulers converted to Christianity to better the circumstances they were already in after the collapse of the Rome empire. it’s not right to single out a whole of people because of their religious affiliation and blame them for their lack of human ingenuity to develop more progressive science. Please consider changing your graph which labels the dark ages as belonging to the “Christians”. Did you read my actual post? I’m arguing against the graph for pretty much the same reasons you mention. Holy dog your headings are unhelpful. Skim-resistant and opaque. Maybe less of the ‘how classically learned am I?’ and more of the ‘hey maybe someone will read this one day’ would be good. A very interesting read indeed; this is the first time I read an article of yours, and I must say I like your style (scarred philosopher, nice one) This article is of particular interest to me, and I will recommend it to others. Keep up the good work.